Protein synthesis is accomplished through a process called translation. After DNA is transcribed into a messenger RNA (mRNA) molecule during transcription, the mRNA must be translated to produce a protein. In translation, mRNA along with transfer RNA (tRNA) and ribosomes work together to produce proteins. Initiation: Ribosomal subunits bind to mRNA. Elongation: The ribosome moves along the mRNA molecule linking amino acids and forming a polypeptide chain. Termination: The ribosome reaches a stop codon, which terminates protein synthesis and releases the ribosome. Transfer RNA plays a huge role in protein synthesis and translation. Its job is to translate the message within the nucleotide sequence of mRNA to a specific amino acid sequence. These sequences are joined together to form a protein. Transfer RNA is shaped like a clover leaf with three loops. It contains an amino acid attachment site on one end and a special section in the middle loop called the anticodon site. The anticodon recognizes a specific area on a mRNA called a codon. Translation occurs in the cytoplasm. After leaving the nucleus, mRNA must undergo several modifications before being translated. Sections of the mRNA that do not code for amino acids, called introns, are removed. A poly-A tail, consisting of several adenine bases, is added to one end of the mRNA, while a guanosine triphosphate cap is added to the other end. These modifications remove unneeded sections and protect the ends of the mRNA molecule. Once all modifications are complete, mRNA is ready for translation. In translation, mRNA along with tRNA and ribosomes work together to produce a protein. 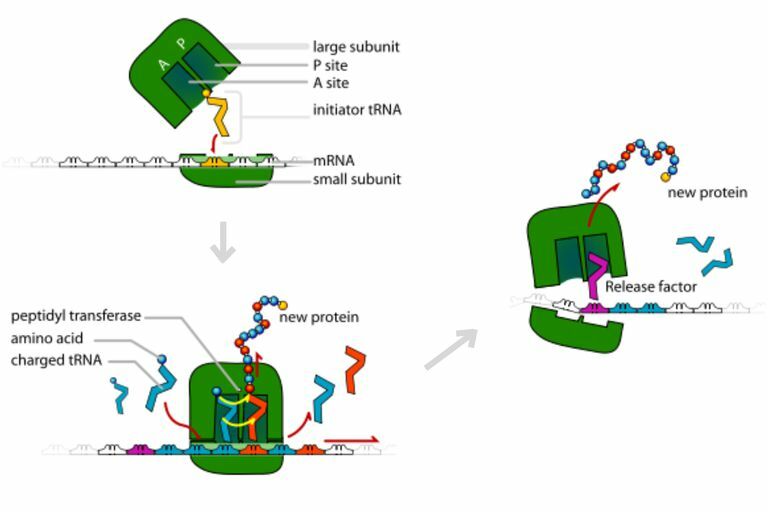 Once messenger RNA has been modified and is ready for translation, it binds to a specific site on a ribosome. Ribosomes consist of two parts, a large subunit and a small subunit. They contain a binding site for mRNA and two binding sites for transfer RNA (tRNA) located in the large ribosomal subunit. During translation, a small ribosomal subunit attaches to a mRNA molecule. At the same time an initiator tRNA molecule recognizes and binds to a specific codon sequence on the same mRNA molecule. A large ribosomal subunit then joins the newly formed complex. The initiator tRNA resides in one binding site of the ribosome called the P site, leaving the second binding site, the A site, open. When a new tRNA molecule recognizes the next codon sequence on the mRNA, it attaches to the open A site. A peptide bond forms connecting the amino acid of the tRNA in the P site to the amino acid of the tRNA in the A binding site. As the ribosome moves along the mRNA molecule, the tRNA in the P site is released and the tRNA in the A site is translocated to the P site. The A binding site becomes vacant again until another tRNA that recognizes the new mRNA codon takes the open position. This pattern continues as molecules of tRNA are released from the complex, new tRNA molecules attach, and the amino acid chain grows. The ribosome will translate the mRNA molecule until it reaches a termination codon on the mRNA. When this happens, the growing protein called a polypeptide chain is released from the tRNA molecule and the ribosome splits back into large and small subunits. The newly formed polypeptide chain undergoes several modifications before becoming a fully functioning protein. Proteins have a variety of functions. Some will be used in the cell membrane, while others will remain in the cytoplasm or be transported out of the cell. Many copies of a protein can be made from one mRNA molecule. This is because several ribosomes can translate the same mRNA molecule at the same time. These clusters of ribosomes that translate a single mRNA sequence are called polyribosomes or polysomes.